When minutes matter, our team offers emergency cardiac care and treatment with powerful results. Where can you find one of the top ten hospitals in Boston? Right here in your community. Recognized in US News and World Report for exceptional cardiac care, you’ll find all the right physicians, pioneering treatments, and critical care services you depend on. It’s everything you need to put your heart at ease. For cardiovascular illness, getting an accurate diagnosis and immediate care can not only save your life, it can help prevent long-term damage to your heart and get you on the right track for many years to come. Cardiovascular disease is any disease that affects the heart and circulatory system of the body. While some people may be born with a cardiovascular illness, many more develop cardiac disease as they age or their bodies are affected by other conditions. There are ways to prevent and treat cardiovascular diseases. In addition to healthy living and wellness, medical help (intervention) can help to reverse or prevent more serious damage with procedures, medications, or special treatment programs. 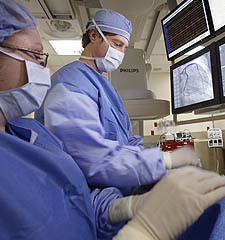 Since opening the Merrimack Valley's first Regional Cardiac Care Center and Catheterization Laboratory in 1991, Lowell General Hospital has taken an active role in providing the most comprehensive range of services for diagnosing and treating cardiovascular disease. Cardiac rehabilitation is an important part of recovery following heart surgery and other cardiovascular procedures. That's why Lowell General offers a comprehensive – and nationally certified – Cardiac Rehabilitation Program. You can expect to be seen by top cardiac specialists, nurses, and caregivers. This is where compassionate people, years of experience, breakthrough new treatments, and personalized care plans all come together to help you stay healthy. Our cardiac care has been recognized for quality and safety. So when it comes to making one of the most important decisions of your life, you can be sure you’re in the best of hands. Heart disease and stroke touch every aspect of your life, as well as the lives of your loved ones. To help make it all a little easier, we provide a wealth of education programs, community services, and free support groups.